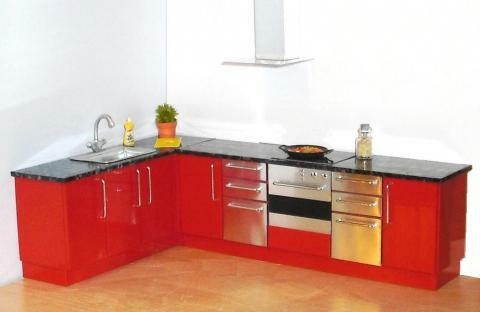 A chic modern kitchen in hi-gloss red with drawers in aluminium. This is from our mornington fixed door range and together with a steel and etched "glass" extractor, has optional "glass" shelves on aluminium rod supports, which provide ample space for displaying your miniatures. Overall dimensions 10 1/4" (26cms) by 6 1/4" (16cms). 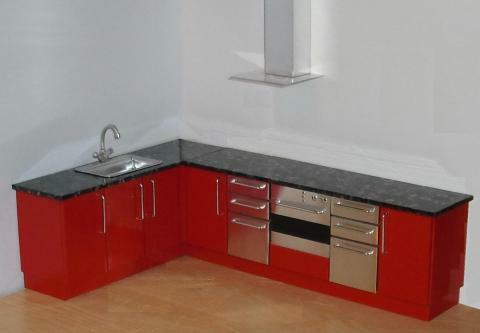 The kitchen can be made with the sink to the left (as in the photo) or to the right (see link to black kitchen at the bottom of the page). Please make your selection below. The price includes the full set of ready built base units and the extractor (please provide the height floor to ceiling of your kitchen, so that we make the extractor to the correct size). You can also order the version complete with the shelves and supports with a template to enable you to fix them to your wall. Also available in black. Please note that photo of red version doesn't show the glass shelves, but they ARE available as an option. 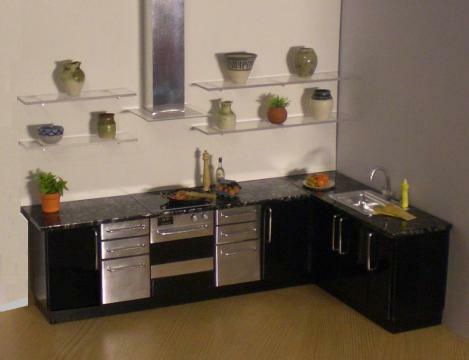 If you would like a similar kitchen in a different finish, please send us an email.